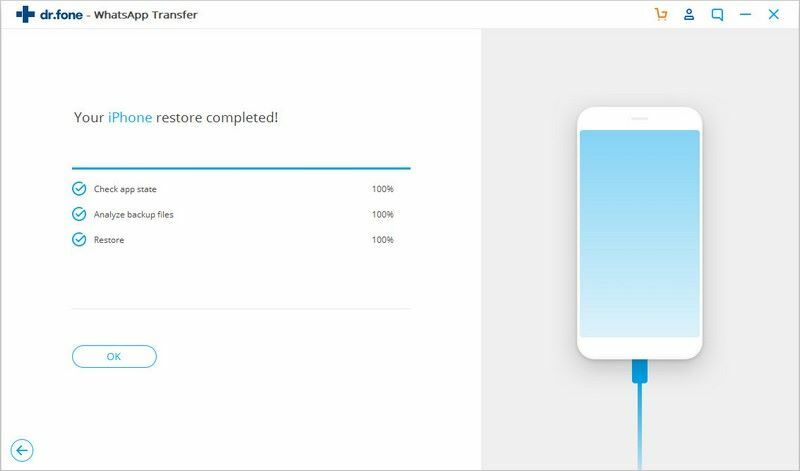 The iSkysoft Toolbox-Restore Social App is able to help you transfer, backup and restore the WhatsApp data for your iPhone, iPad or iPod touch. 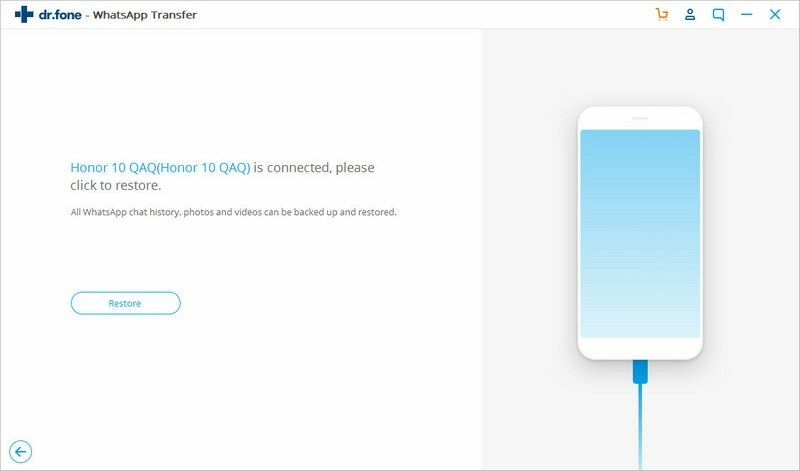 It enables you to transfer the WhatsApp files from an iPhone, iPad or iPod Touch to another iOS or Android device. 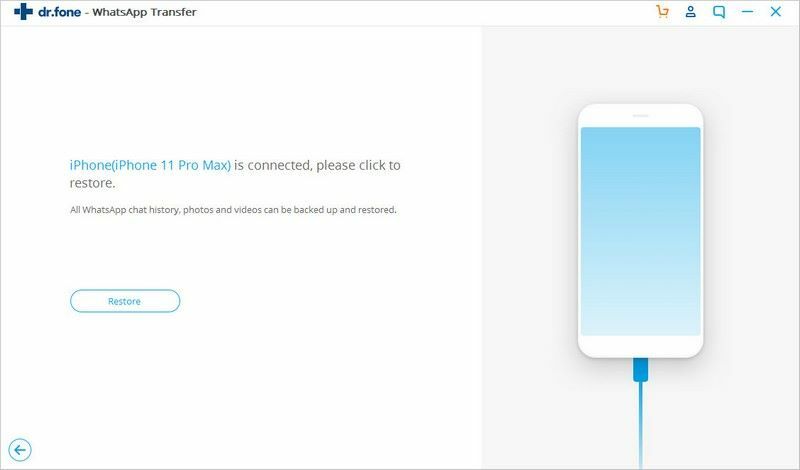 On top of that, it also allows you to make a backup of your iPhone/iPad WhatsApp data to the PC and meanwhile restore the WhatsApp backup files to another iOS or Android device. 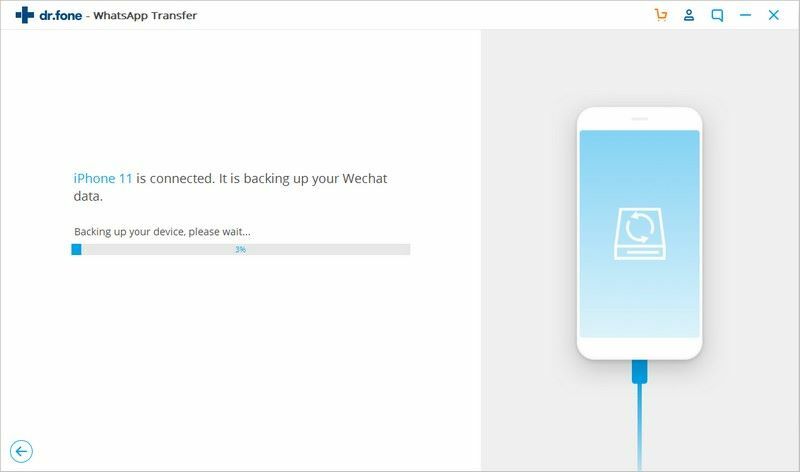 Here we introduce some step-by-step tips on how to use the iSkysoft Toolbox app for helping you transfer, backup and restore your WhatsdApp messages in the easiest way. Firstly, let’s start with installing and launching the iSkysoft Toolbox app on the computer. 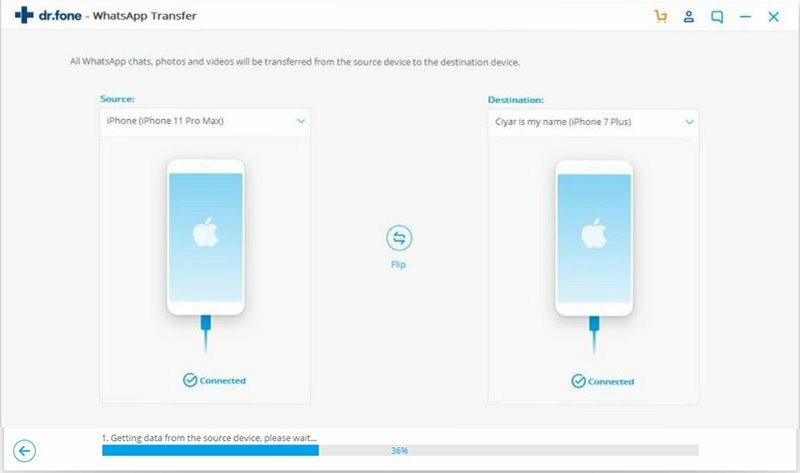 When this is done, please click on “Restore Social App” on the app homepage and then plug both your source and destination iOS devices into the computer. On the next page, choose “WhatsApp” from the left side of screen and continue to tap on “Transfer WhatsApp messages”. 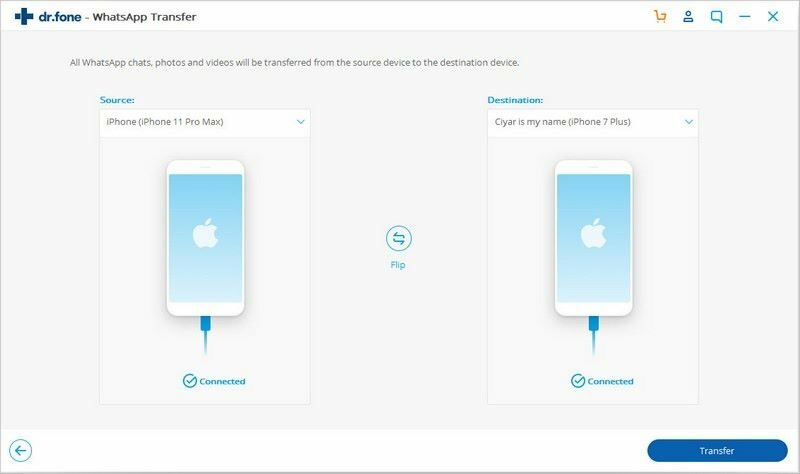 In this section below, the program will display both of your source iOS device and destination iOS device and inform you whether they are connected successfully. Please note the source ios device is located on the left side and destination ios device on the right side of screen. Here you can tap on “Flip” to change how they are placed. 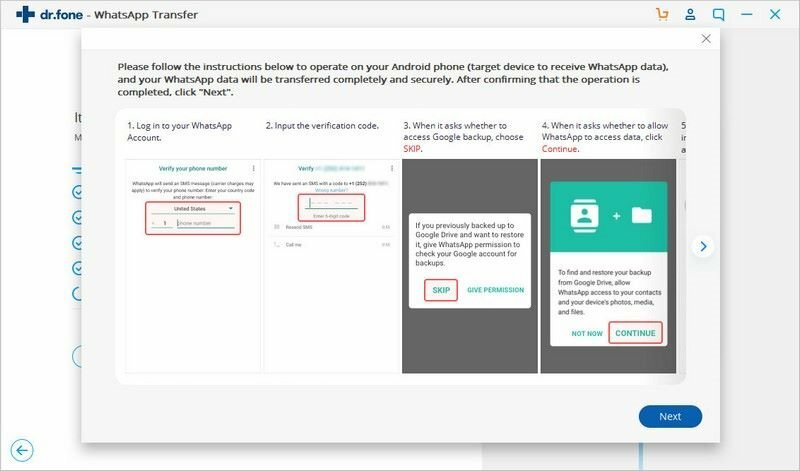 To transfer WhatsApp messages successfully, please make sure you’ve logged in WhatsApp account on the destination ios device firstly. Next, please tap on “Login successfully. 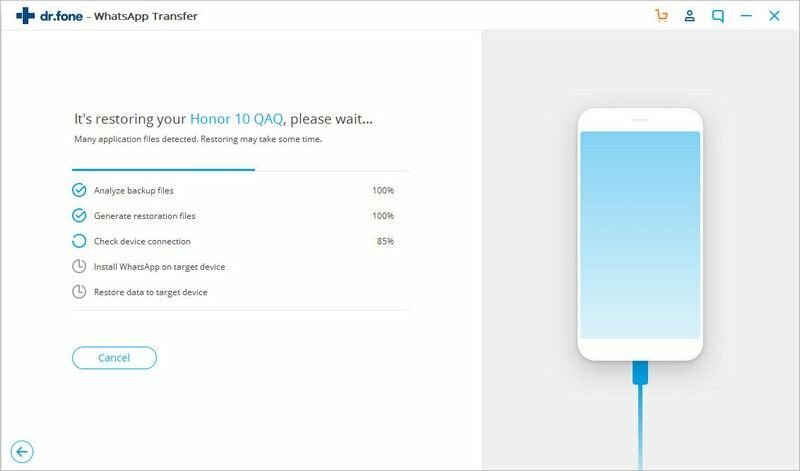 Continue” and hit on “Transfer” button at the screen below. Then click “Yes” when a pop-up asks for permission to continue or not, which reminds you that the existing WhatsApp chat history on the destination device will be overwritten if you continue this step. 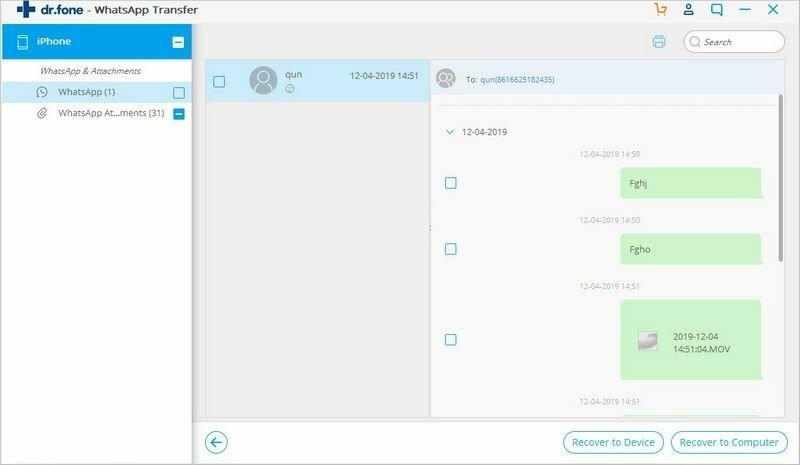 After you agree to continue transferring WhatsApp messages, the transferring process will start until it finishes completely. 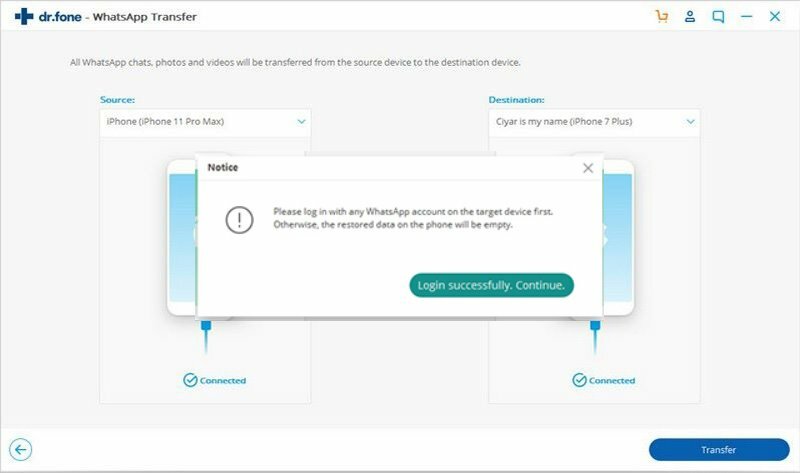 When you receive a notice stating “Transfer completed”, you can remove your destination phone from the computer and check whether all of data is transferred successfully. Download and launch the iSkysoft Toolbox on the PC. Then tap on “Restore Social App” in the toolbox. Next, we will choose “WhatsApp” and select the “Transfer WhatsApp messages”. 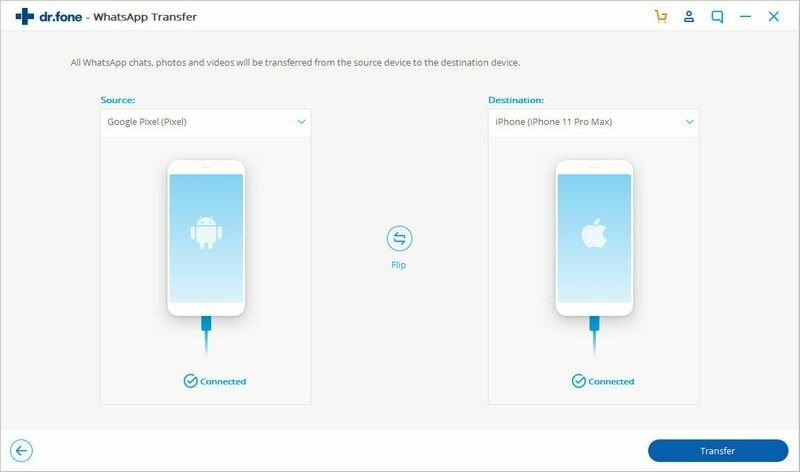 After that, let’s move on to connect both of our iOS device and Android device to the PC and check whether they are connected successfully at the screen below. After this, we click “Transfer” in the bottom right corner as shown below. 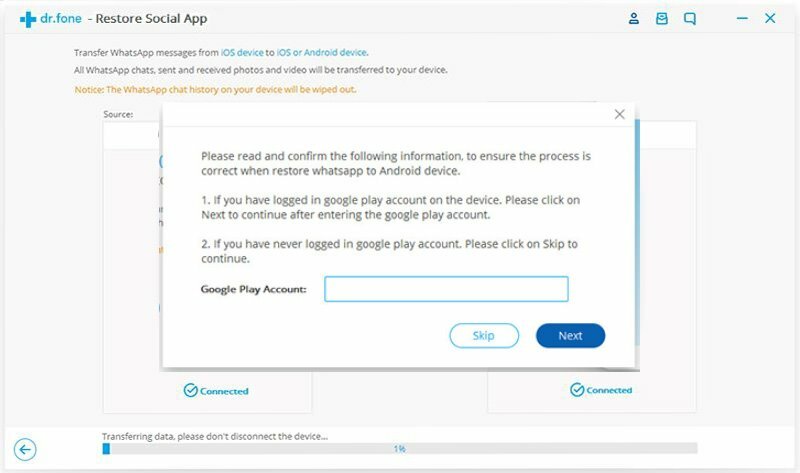 On the next screen, please select “Skip” option if you have never logged in google play account on the destination phone. Otherwise, please type in your google play account and click “Next” to go to the next step. Next, please click “Yes” when a pop-up window appears confirming that the existing WhatsApp messages on the destination will be overwritten after restore process. The iSkysoft Toolbox begins the WhatsApp restore process from iOS to Android. Make sure the devices stay connected during the process. 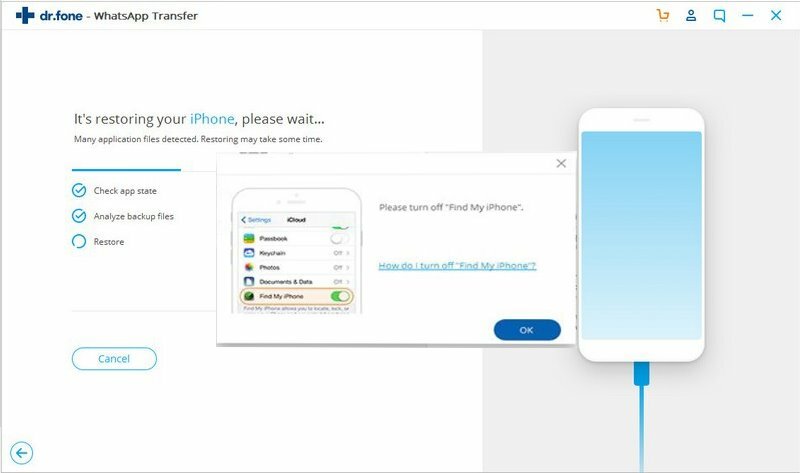 A pop-up will appear stating “Transfer completed” after the transfer process finishes completely. Download and run the iSkysoft Toolbox program and choose the “Restore Social App” in the toolbox. Then you need to plug your iPhone/iPad device into the computer. 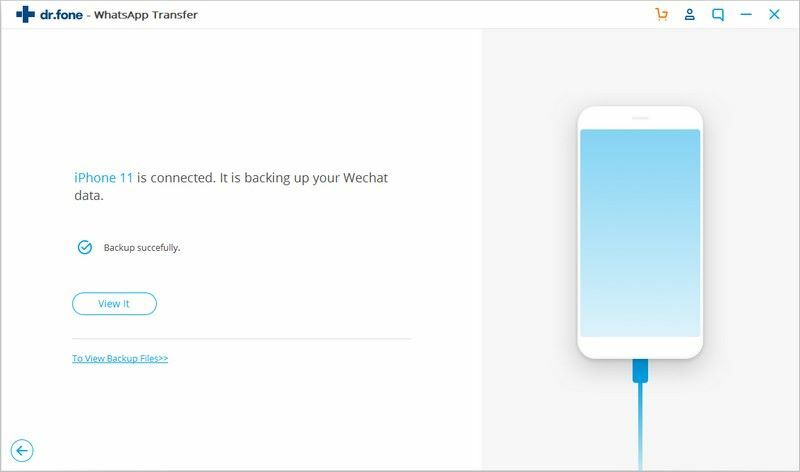 One the screen below, please tap on “WhatsApp” and then choose “Backup WhatsApp messages” to initiate WhatsApp backup process. The iSkysoft Toolbox will start to back up the WhatsApp messages on iPhone/iPad or iPod. When it finishes, the program will show a pop-up stating “Backup successfully”. When the WhatsApp files are backed up completely, you can check on what kind of data is stored by clicking “View it” button below and at the same time selectively export the data to the PC or another iOS/Android device. Plug your iPhone/iPad into the PC and open the iSkysoft Toolbox. Next, please choose “Restore Social app” on the app homepage below. Then please click “Restore WhatsApp messages to iOS device” to start scanning the WhatsApp backup files. 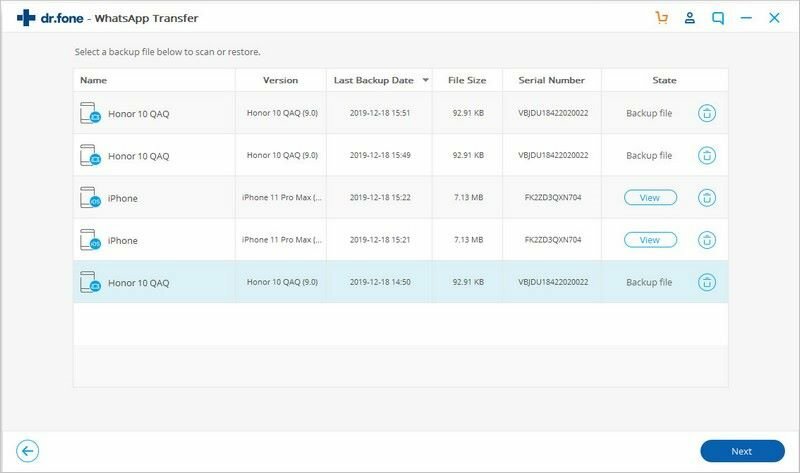 When backup scanning is finished, you will see all of backup records on the screen and can choose and view one of them to start restoring the WhatsApp data to your iPhone/iPad device selectively. 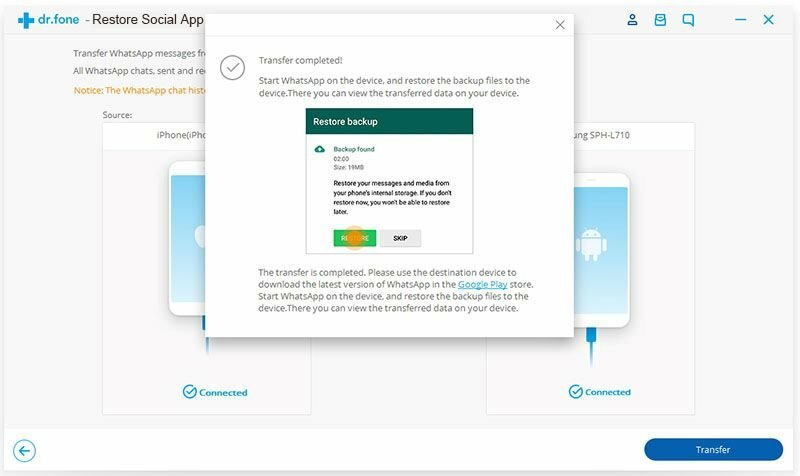 The iSkysoft Toolbox will display the WhatsApp backup files in different categories and enable you to export them selectively to your iPhone, iPad or iPod device. To start restoring WhatsApp messages to your iPhone/iPad or iPod, please tap on “Restore to Device” below. Next, click on “restore” button to initiate the restore proces. Please make sure that you have turned off “Find my iPhone” on device by going to “Settings”>”iCloud”>”Find my iPhone” on your mobile device. Be patient and keep your iOS device connected until the restore finishes. From the very beginning, you need to download and run the iSkysoft Toolbox on your computer and then choose “Restore Social App” at the screen below. 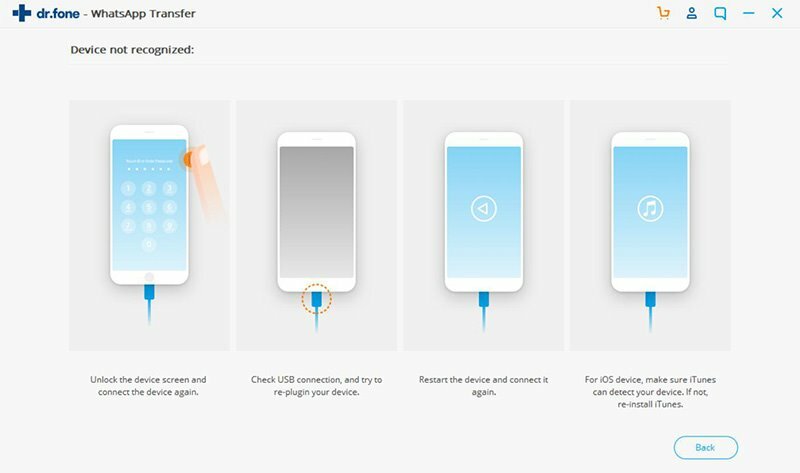 After this, make sure your Android device is connected well to your computer. Then you will see all of WhatsApp backup files you ever made with the iSkysoft Toolbox. Here choose a backup file you need to restore and hit on “View” button. 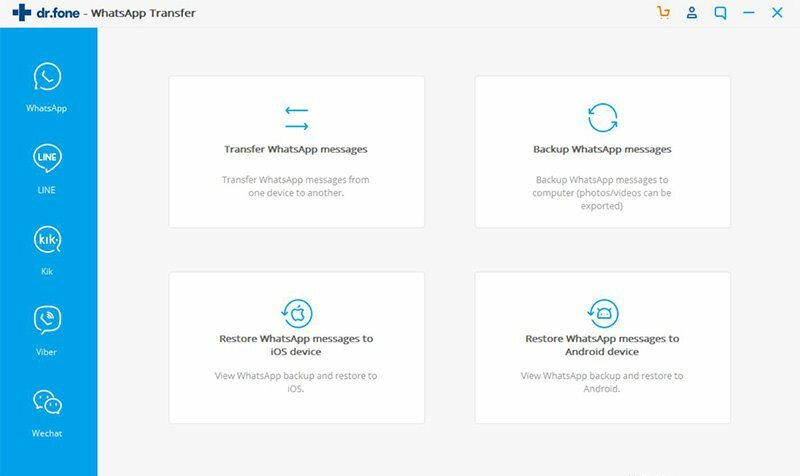 Following the last step, you are able to preview and select all or part of WhatsApp backup data that’s orderly listed as shown below. Just tick your desired WhatsApp data files and then tap on “Restore to Device” to export them to your Android device. 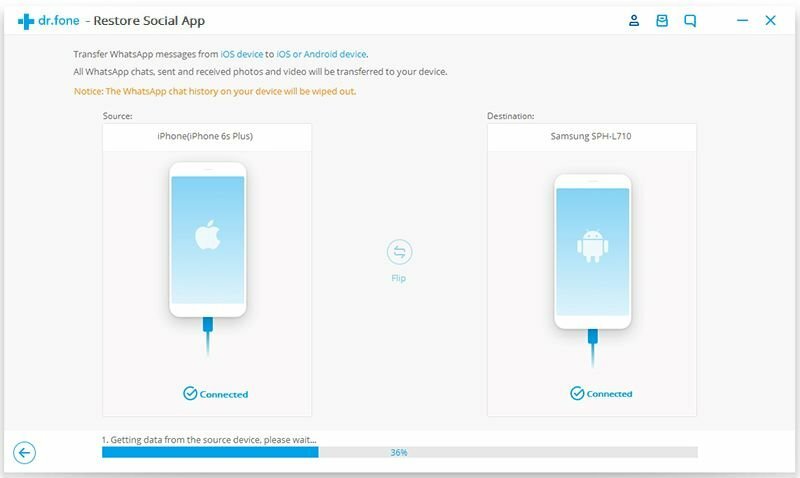 To begin the restore process, please click “Yes” on your Android device to enable the USB debugging. Then please click the “Restore” button to start restoring WhatsApp data to your Android phone or tablet. 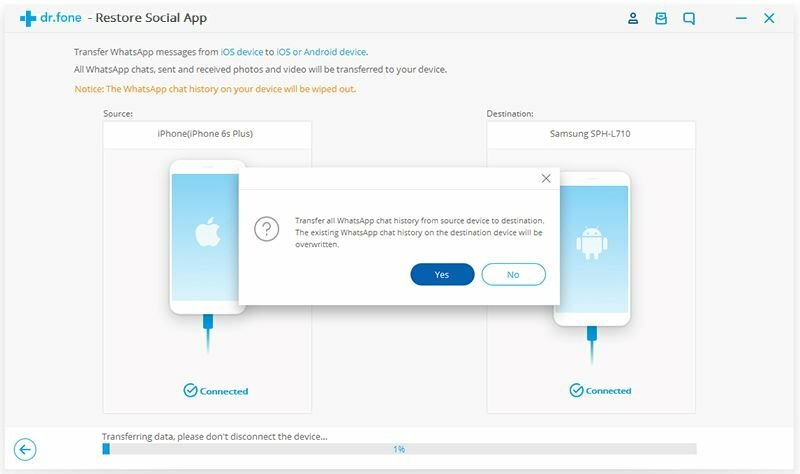 Make sure you do not disconnect your device before restore process is done. A pop-up window will appear when the restore process is completed successfully.